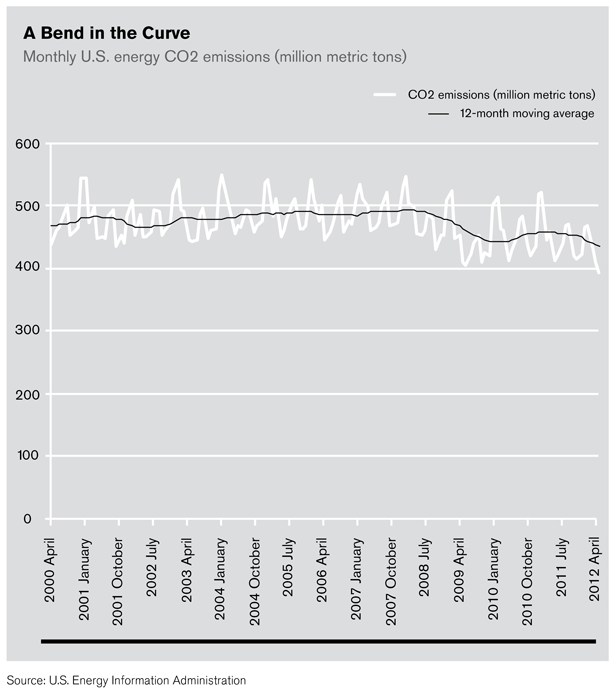 New data show emissions from January to March were the lowest in two decades. More electricity in the United States is being generated by natural-gas fired power plants, and less from coal. This shift, combined with unusually low heating demand last winter and reduced gasoline demand, meant the country emitted the smallest amount of energy-related carbon dioxide in a January-to-March stretch since 1992, according to a report out this month from the U.S. Energy Information Administration. Historically, coal has been the country’s dominant source of electricity, but in the final two months of 2011 its electricity contribution fell below 40 percent for the first time since the spring of 1978, says the EIA. Meanwhile, contributions from gas-fired plants have been steadily increasing, and in April of this year the contributions from coal and gas were equal—each was the source of around one-third of the total electricity produced. Natural-gas power plants produce around half the carbon dioxide that coal plants do. Energy production in the U.S. produced around 1,340 million metric tons of carbon dioxide emissions during the first three months of this year, just two million metric tons more than the same three-month period in 1992. Along the way, first-quarter emissions reached a high of nearly 1,580 million metric tons, in 2004. Last year’s first-quarter total was 1,453. In this chart, fluctuations within a single year reflect the sharp rises in demand during especially cold or hot months. The black line represents the 12-month moving average. Emissions dropped sharply in 2009 due to the global recession, rebounded in 2010, and now appear to be in gradual decline.